The baby is just a few days old. While she plays gleefully, a group of people surround her. They are her uncle and aunties. ‘She looks just like her mother!’ – someone says. ‘But has the eyes of her father’ – says another. They are all geneticists. Natural, untrained specialists in genetics, like most other people. Even though the science of Genetics is just fifty years old, people have an intuitive knowledge of its principles since thousands of years. That’s why it comes to us as no surprise when a child looks like its father or sings well like its mother. We expect the children of a tall couple to be tall. We avoid marrying those who look unhealthy. So genetics is an intuitive science. We should all be able to understand it, without having to stretch our thinking too much. It should be fun to explore how much knowledge of human beings this young science has uncovered. Most of the material in this article is very basic and readers who have read any book on genetics should skip it. The first visible effect of genetics is inheritance, as we have seen. Children inherit some characteristics of their parents, such as height, color of hair and eyes and baldness. So let’s begin our exploration with Inheritance. Sometimes, inheritance does not seem to work. This surprises us. A light eyed child is born to parents both with dark eyes. A tall couple has a short son. For us, this surprise is a good place to start. Think of the tall father. He has something that not only makes him tall, but his child as well. What is this something? Let’s imagine a small strip of stationary, on which the instruction ‘Tall’ is written. This strip is hidden somewhere in the body. The body has to obey the instruction and become tall. The father in our example surely has this instruction strip. At this point you must have started wondering if there is a real instruction strip and where it is kept. We will be talking a lot about these strips, they really exist. So please have patience. Back to our story, the father must be passing this instruction to his son. The only way to do that is through the sperm. So a copy of the instruction strip is carried through the sperm. That tells us another thing. Since the sperm is very small, this instruction strip should also be very very small. The baby will be conceived only when the sperm fertilizes an egg coming from the mother. The mother of course must be having a Height Instruction strip of her own. She passes a copy of that through the egg. So the child will have two Height Instruction strips. Since all of us are children of our parents, it follows that we must be having two copies of such instruction strips. 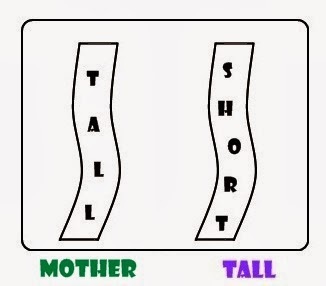 But suppose the mother has passed a Height Instruction strip that reads ‘Short’. What will happen? The child will have two instructions, one to make the body tall, another to keep it shorter. Which instruction will be carried out? It appears that the instructions have a personality. Some instructions are dominant. Others are a little shy and hesitating, lets call them Recessive. So when two opposing instructions come together, dominant wins. In our example either Tall or Short is written on the instruction strip. Tall is dominant and Short is recessive. So if the child has one Tall and one Short instruction, it will grow tall. Just look back and think about our story once again. The father in the story is tall. But don’t forget he has two Height Instructions, so one may be Tall and another may be short. Similarly the mother also has two Height Instructions. She can also have one Tall and one Short. Which instruction is copied into a sperm and the egg is a matter of chance. Sperms are millions in number. Which sperm meets the egg is also a matter of chance. So there is a lot of chance involved in the two instructions the child gets. 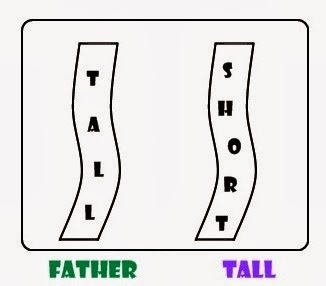 Short from father – Short from mother too: The child becomes short, as there is no Tall to dominate. As you can see, the possibility of the child being short is less as compared to being tall. But there certainly is a chance, 1 in 4. If that happens, you will see a short child being born to tall parents. You must have figured out by now that Height is not the only instruction we carry. There are a lot more instructions. These instructions rule the making of our body. They are called Genes. The stationary on which they are written is called DNA. And the safe place where they are kept is the nucleus of our cell. Each and every cell in our body carries them. Imagine a long thin strip of paper on which instructions are written one after another. This is how we should imagine DNA. All human beings have the same genes, which means they have the same instructions written on the DNA paper. But each instruction comes in many varieties – like the Height Instruction in our example came in Tall and Short variety. The Color of Eye instruction comes in Black, Grey, Blue, Green and many other varieties. These varieties are called ‘alleles’ of the gene. So Tall and Short are alleles of the Height gene. So even though the genes are same, the DNA paper of every person looks different. The only exception is identical twins, who have identical DNA. In fact, all living beings on earth have the DNA paper. From bacteria to banana to humans, all share the same machinery of inheritance. This basic understanding of mechanism of inheritance can lead us to more interesting facts in the genetic world. Why genes cause diseases like cancer? How do genes shape our body and mind? What is DNA testing? Now that we know the machinery, we would get out to explore its products in the next article.